If you’re a Beatles fan, you’ll want the Epiphone EJ160E because of its John Lennon connection. But even if you don’t give a fig about John, Paul, George or Ringo, you might still want this model for the incredible quality and sound. While this model is a tad more expensive than some Epiphone models, this still-affordable limited-edition signature model aims to replicate the guitar John Lennon used to break new ground for rock in those early Beatles recordings. And you know what? It does a great job of bringing that classic sound to today’s value-conscious players. 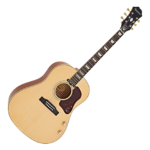 In fact, this model is actually called the Epiphone EJ-160E John Lennon Acoustic-Electric Guitar because it pays tribute to Lennon and his early sound. And don’t think for a minute it’s all hype. This model can do just about everything Lennon’s could — assuming, of course, that you can play like he did. The Epiphone EJ-160E has a warm, very natural acoustic sound that can be pressed into some high-output electric punches when necessary. Featuring a spruce top with mahogany back and sides, this guitar is a simple masterpiece that uses only a single-coil pickup at the neck. Volume and tone controls are also included. This model comes in a vintage cherry sunburst finish, the perfect choice for this near-perfect tribute guitar. Modeled on the Gibson J160E, more than one reviewer has said this model is easier to play and sounds better than the Gibson, and we’re inclined to agree. The two models are essentially the same except for where they are manufactured. With the Gibson model, you’re paying a premium to get an American made guitar. 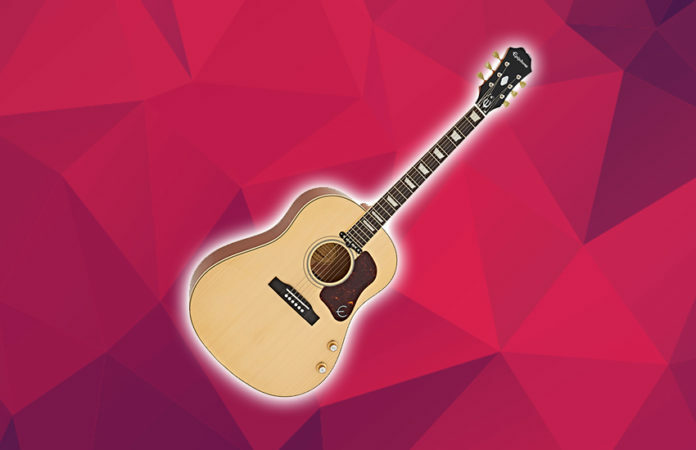 The Epiphone model is made in Asia. While this might be a point of pride for you, the country where a guitar is made doesn’t determine its quality. That’s why we suggest you save yourself some money and go with the much less expensive Epiphone EJ-160E. We’ve scoured dozens of reviews looking for some negative points to balance out our glowing review of this model, and we just didn’t find much worth mentioning. You see, even people who don’t care one way or the other about John Lennon like this guitar because it’s well made, it looks great and it sound incredible. We happen to like The Beatles, so we’re all that much more enamored. We think you’ll like the Epiphone EJ160E — and that you’ll make it your primary acoustic-electric guitar for years to come. Go ahead. Prove us wrong.